Why did you join Anytime Fitness? Honestly, I first joined because it is right across the street from where I work. (which meant I had no excuse not to go) I am so glad I did, because the environment and the trainers have really made it one of the best experiences I have had at a gym! What positive results have you seen from your workout so far? Not only have I lost weight (a total of 15lbs so far) I have noticed I have more energy in daily activities, I was tired just hours after I had woken up. No matter how much caffeine I drank I was still tired. I can now function throughout the day without needing the caffeine that I used to. I enjoy (now more than ever) my time at the gym, and I really look forward to going. Also, with working out I have become more aware of my eating habits and because of that, I have fallen in love with cooking. What is your typical regimen for exercising, days per week, and length of time per day? I typically try to workout about 5 days a week and my workouts last anywhere between 45 minutes to 2 hours depending on if I do cardio that day. What is your favorite exercise or piece of equipment? I love kettlebells and the squat rack. Before Jessica taught me how to use the squat rack, it actually scared me! What are your future fitness goals? I definitely want to be able to do a plank for 5 minutes! But my long-term goal is to continue to live a fit and healthy life-style. If you could do one Olympic event, what would it be? Definitely gymnastics! What hobbies and interests do you have outside of the gym? I love to camp, and go hiking, swimming, going to festivals. Pretty much anything outdoors! What is your favorite cheat food? Definitely pizza. Where is your favorite vacation spot (other than Anytime Fitness)? Anywhere that is warm! It is always nice to get away from the cold. What advice can you give to new members just starting out? My advice to new members is to not give up because results don’t happen overnight. I didn’t see results for a decent amount of time. 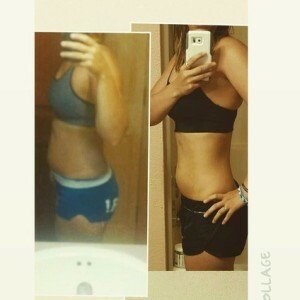 I got really down on myself, I just kept pushing myself and I eventually saw results, which is such an awesome feeling. Also, find someone to give you moral support. If it’s a loved one or a trainer, just find someone you can call or talk to in the good times (maybe you lost a pound or hit your goal) and the bad (you haven’t seen results and feel like giving up) it really makes a huge difference. Previous Post:Success Story- Laurie M.
Next Post:Success story- Diane P.